Rep. Steve Rothman’s attempt to convince people that President Barack Obama is pro-Israel (“Obama’s Pro-Israel Record,” POLITICO, July 25) fails on many levels. While he claims it is Republicans who “label the president as anti-Israel,” concerns with Obama’s problematic stance on Israel extend beyond the ranks of the GOP, in the U.S. and beyond. As The Wall Street Journal noted, even “Jewish fund-raisers for Mr. Obama say they regularly hear discontent among some supporters.” Furthermore, a Jerusalem Post/Smith Poll found that only 12 percent of Israelis consider Obama to be pro-Israel. On the substance, the weakest part of Rothman’s argument is that it is predicated on U.S. military cooperation with Israel. Most of this cooperation, however, started long before Obama, and much of the credit belongs to Congress — where Israel is far more popular than at the White House. In addition, this cooperation is not some kind of favor that presidents bestow on Israel. It benefits both sides, and it is dangerous for the future of the relationship to suggest that military collaboration depends on a president’s largesse. Rothman focuses on military cooperation with Israel because he knows how strong the case that Obama is hostile to Israel is in other areas. Obama had Vice President Joe Biden criticize Israel during a visit to Israel. He tried to undercut Prime Minister Benjamin Netanyahu on the eve of his visit to Washington. Obama has pushed Israel on construction of housing projects and tried to establish the start of negotiating efforts with the Palestinians at the 1967 borders — which Israel argues are indefensible. Rothman notes the pressure President George H.W. Bush put on Israel in the early 1990s. American Jews noticed — and Jewish support for Bush dropped by 24 points between the 1988 and 1992 elections. Perhaps Rothman’s piece is evidence of his concern that American Jews could give Obama similar treatment. Troy was a senior White House official under President George W. Bush. Assemblyman David I. Weprin, center, is a Democrat running against Bob Turner for the House seat Anthony D. Weiner gave up. Former Mayor Edward I. Koch, in jacket, with Mr. Turner, a Republican, whom Mr. Koch endorsed for Congress on Monday. On Monday, former Mayor Edward I. Koch, a Democrat, endorsed the Republican candidate in the race, Bob Turner, a retired cable television executive, at a press conference at which he stood next to an Israeli flag. Mr. Koch has acknowledged that Mr. Weprin is a strong supporter of Israel, but argued that the election of Mr. Turner would serve as a rebuke to Mr. Obama for saying that Israel’s pre-1967 border should be the basis for a peace agreement. Both Mr. Weprin, 55, and Mr. Turner, 70, have criticized the president’s position on Israel, and both promote their support for Israel on their campaign Web sites. 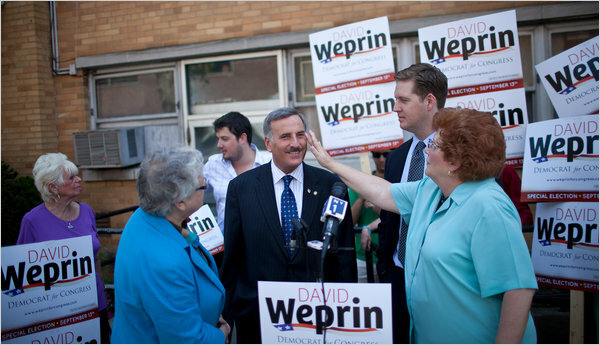 But Mr. Koch said that although he and Mr. Weprin had similar political ideals, he had concluded that Mr. Weprin could not be “an effective messenger” to Mr. Obama. The activists aboard the lone Gaza-bound flotilla ship intercepted by Israel were deported. Some 15 activists, journalists and crew members were deported throughout the day Wednesday, a day after the French-flagged Dignity al-Karama was boarded by Israeli commandos near Gaza waters and towed to Israel’s Ashdod port. One activist was an Israeli journalist and was not deported. The ship reportedly had declared a port in Egypt as its final destination in order to be able to leave Greek waters. At least seven other flotilla ships were detained and remain in Greek ports for safety violations. The Dignity was carrying about 10 French and Greek activists, as well as three journalists and three crew members. After boarding the ship, Israeli troops checked the condition of the passengers and offered them food and drink, according to the Israel Defense Forces. The passengers were turned over to officials from the Israel Police, the Immigration and Population Authority and the Interior Ministry. They could be denied entrance to Israel for the next 10 years because they are being deported. Fifteen foreigners aboard the Gaza-bound boat Dignite were being deported out of Israel on Wednesday, Israeli officials said. “Some of them have already left this morning and the rest will fly out during the day,” said Sabin Hadad, spokeswoman for the Israeli interior ministry. The Dignite — carrying 10 activists, three crew members and three journalists — is affiliated with the Free Gaza Movement. One of the journalists is Israeli. Israeli naval forces Tuesday successfully took over the boat, which was intent on breaking what the activists call the “siege of Gaza,” without violent resistance. The forces “operated in line with procedures and took every precaution necessary while using all operational tactics determined prior to the operation, and avoid causing harm to the activists on board while ensuring the safety of the soldiers,” the Israel Defense Forces said. Herman Cain loves deep dish pizza, but he may love Israel more. How do I know? I’m pretty sure he wouldn’t go to war with a man who stole a pepperoni slice; but if he were president and if a country, even one with a huge army like Iran’s, caused problems with an ally like Israel, there’d be trouble. “Option A is, ‘Folks, we are not going to allow you to attack Israel,’ ” the GOP presidential hopeful told the Washington Times. On Tuesday, July 18, IDF soldiers boarded a French yacht heading to the Gaza Strip, in order to ensure it did not break Gaza’s maritime security blockade. 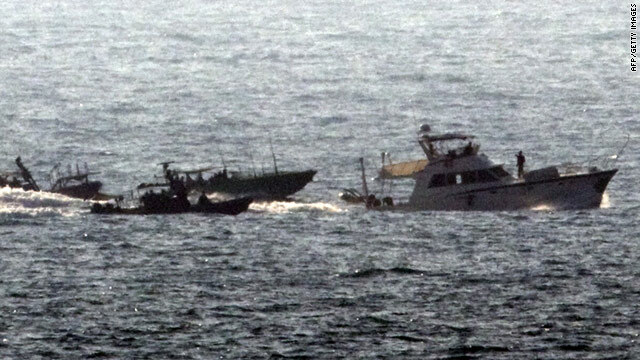 The yacht – the MV Dignite/Al Karama – was intercepted by Israel before being towed to shore in what is being described as an “uneventful takeover”. The Israeli boarding of the vessel by IDF navy soldiers came after “after all diplomatic channels had been exhausted and continuous calls to the vessel had been ignored,” according to a military statement. The yacht’s16 passengers were offered food, drink and medical exams. Prior to intercepting the yacht, four Israeli military boats flanked the vessel and warned its crew not to attempt to breach the sea blockade off Gaza. The yacht left the Greek island of Kastellorizo on Saturday evening after Athens imposed a ban on the departure of any ships involved in the flotilla. Early on Tuesday, activists on board tweeted via @BateauGazaFr that they were still determined to reach Gaza. Israel insists the Gaza blockade is both legal and vital in ensuring that the terrorist organization, Hamas, does not gain access to incoming funds and/or weapons that would be used to attack Israel. The military had warned it would stop any attempt to break the sea blockade of Gaza, which Israel imposed four years ago in what it says is a measure to prevent arms smuggling to Gaza’s ruling Hamas militant group. State of Illinois Governor Pat Quinn arrives in Israel today for a week of meetings with a number of high-ranking Israeli officials along with briefings from experts on a range of issues of interest to the people of Illinois, including hi-tech development, energy, environmentalism, education, security, and disaster preparedness. Early stops include visits to the “Solutions” facility maintained in Israel by Motorola, one of the largest Illinois-based companies, and the offices of Better Place, a battery-operated car innovator. On Thursday the Governor will participate in a ceremony at Ben Gurion University of the Negev in Beersheba at which officials of Ben Gurion University and the University of Illinois at Chicago will sign a formal Agreement on Academic Cooperation to establish a wide-ranging relationship. The agreement will promote faculty exchange, student exchange, joint research projects, and other academic activities of joint interest. The agreement grows out of and greatly expands joint efforts in which the two universities have already been involved in the field of Public Health. Rivka Carmi, President of Ben Gurion University, will preside over the ceremony, and the University of Illinois at Chicago will be represented by the Dean of the School of Public Health, Paul Brandt-Rauf. On Sunday Quinn will join Dr. Uzi Landau, Minister of National Infrastructures, in signing a Memorandum of Understanding establishing a “Sister Lakes” relationship between Israel’s Lake Kinneret (the Sea of Galilee) and Lake Michigan. The latter entity borders the state of Illinois and is the fresh water source for Chicago and its surroundings. The agreement references joint concerns regarding water purification, invasive fish species, and other issues. Quinn will visit sites along the Kinneret itself, on a tour led by key figures in Israel’s Oceanographic & Limnological Research. 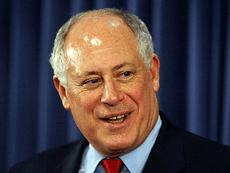 The Governor’s Educational visit to Israel is organized by the Jewish United Fund of Metropolitan Chicago and made possible by a generous donor. The visit is part of a JUF initiative that for years has brought influential non-Jewish leaders to Israel. Joining him on the visit are Illinois State Senators Jeffrey Schoenberg and Ira Silverstein, along with Skip Schrayer, Chairman of the Jewish United Fund, Michael Kotzin, Executive Vice President of the Jewish United Fund, and several Illinois business leaders.